Compiled by Corinthian’s travel experts, Sri Lanka Top Ten has been designed as a reliable reference point to enable you to identify the absolutely unmissable Top Ten Sights in Sri Lanka, as well as the most exciting Sri Lanka Travel Experiences, and Sri Lanka’s most notable and luxurious hotels. There are of course besides a myriad of other marvels and wonders to been seen and experienced. Every list is by its very nature highly subjective and restricting ourselves to naming just ten has been no easy editorial task! We hope that our Sri Lanka Top Ten suggestions will provide a flavour of the country’s magic and will inspire you to explore further. 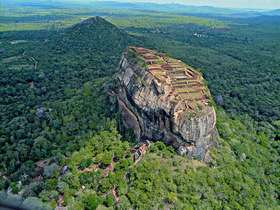 On the Sri Lanka destination page you will find more detail; including an extensive list of private tour suggestions, a guide on where to travel, and our preferred hotels. Alternatively, call us! We would lo to hear from you. Dambulla, which lies to the south of Sigiriya, is home to Sri Lanka’s largest and best-kept cave temple complex that dates back to over 2,000 years ago. The complex filled with several hundreds of images of Buddha in the form of stone statues and paintings, features colourful frescoes on the rock ceiling that illustrate the Buddhist mythology. The highlight for many is the visit to one of the narrow caves, filled with a colossal 14m long reclining Buddha carved out of single rock. 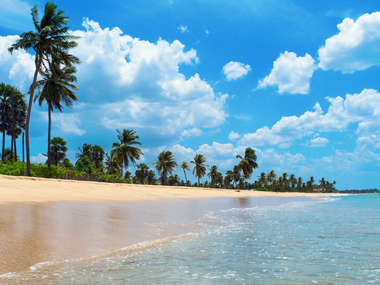 The charming historic city of Trincomalee, in northeast Sri Lanka has miles of unspoilt white sandy beaches - rivalling those in the neighbouring Maldives. A visit to Trincomalee offers the enticing prospect of lazy days by the beach, going on a whale and dolphin watching expedition and observing the magnificent marine life while snorkelling. Trincomalee itself is well worth exploring. Highlights include a walk through the historic star-shaped Dutch built Fort Frederick (1655), see a colourful ‘pooja’ at the ancient Koneswaram Kovil (Temple of a Thousand Pillars) and exploring the markets on foot. 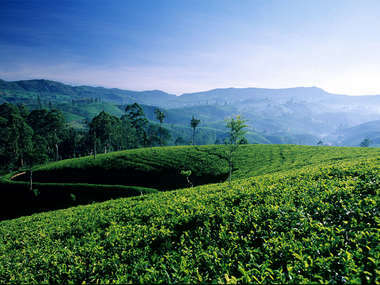 Sri Lanka’s central highlands is synonymous with Tea. In the mid to late 19th century, the central highlands’ relaxed lifestyle combined with the ideal environment to grow and produce some of the best flavours of tea attracted British planters to establish several tea estates. Now, many of these original planters residences’ have been converted into character-rich, luxurious bungalows, offering visitors an unique opportunity to experience colonial style living. Combine stay in one of these bungalows with a visit to a tea-factory and soft treks taking in the mountain scenery. Sinharaja, renowned for its biodiversity, is a Unesco World Heritage Site and Sri Lanka’s last remaining stretch of virgin rainforest. 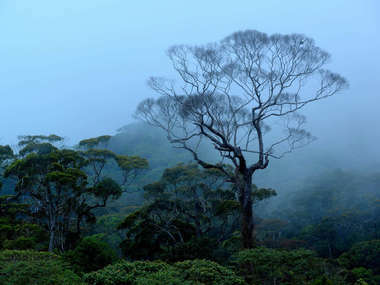 A treasure trove of endemic species, especially birds, the forest also provides shelter to endemic reptiles, butterflies, mammals and rare amphibians. A soft trek through the magnificent rainforest offers the opportunity to observe the fascinating ‘mixed-species feeding flocks’ of Sri Lanka, 30 out of the island’s 33 endemic birds along with wildflowers, butterflies and dragonflies. Wilpattu National Park, is Sri Lanka’s largest and one of the oldest wildlife reserves. The park, which re-opened in 2010, is an unspoilt picturesque wildlife reserve with open grasslands, dense scrub jungle and a unique complex of lakes called ‘Villus’. 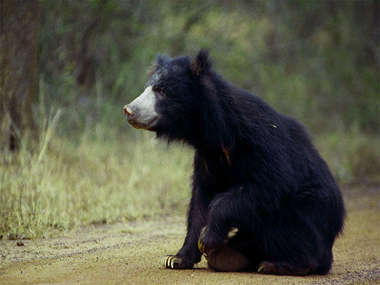 Situated along the northwest lowland dry zone, the park is home to a healthy population of leopards and sloth bears. A full-day visit to Wilpattu wildlife reserve is highly recommended, given the size of the park. 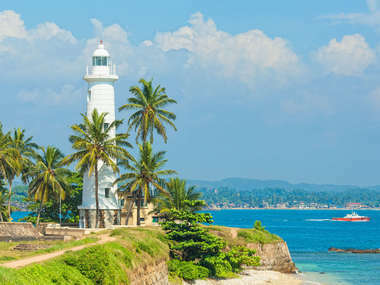 The UNESCO World Heritage town of Galle, located at the southwestern tip of Sri Lanka, is an ancient, fortified town with a fascinating maritime history. The town’s main attraction is the 17th century Dutch Fort. Originally built by the Portuguese, the fort, perched on a promontory, is the best preserved fort in Sri Lanka. 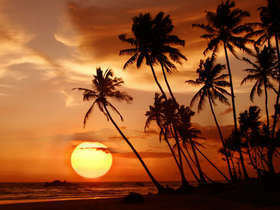 Today, Galle’s palm fringed coastline, with its upmarket beach hotels and boutique hotels within the fort itself, is one of the most developed areas in Sri Lanka. Jaffna, steeped in glorious but turbulent history, was at the heart of Sri Lanka’s civil war. Now, following remarkable post-war recovery, the Jaffna town, regarded as an emerging star, provides a fascinating insight into the province’s rich history, distinct cultural and culinary traditions. 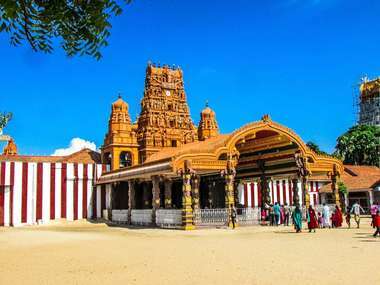 As part of a tour of Jaffna visit the 17th century star-shaped Jaffna Fort, the ancient Nallur Kandasamy Kovil - an architecturally striking Dravidian style Hindu temple and explore Jaffna’s bustling market to experience first-hand how different is Jaffna from mainland Sri Lanka. 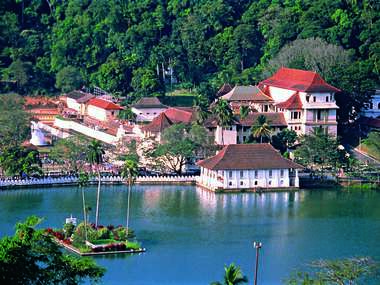 The magnificent Temple of the Tooth with gilded roof, exquisite woodwork and beautifully decorated walls with paintings is set in Kandy. Enshrined within the temple is the sacred tooth relic of the Lord Buddha that was brought to Sri Lanka in the 4th century AD. Observe the lively afternoon ‘Pooja’, which is held in honour of Lord Buddha and accompanied by drumming and traditional music. During the spectacular annual Kandy Esala Perahera festival, (celebrated July/August), the sacred tooth relic, encased in a golden casket, is taken in procession through the streets of Kandy. 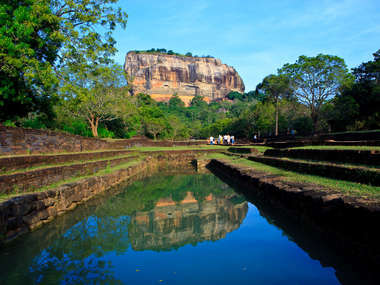 At the heart of the cultural Triangle lies the iconic Sigiriya rock citadel, an ancient capital of Sri Lanka. The ruins of the royal palace at the summit is reached by a path that takes you past moats, pleasure gardens and fountains. 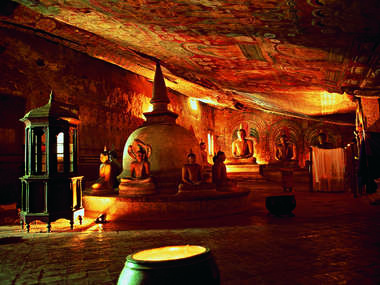 Halfway up the rock are the famous Sigriya frescoes, believed to be the most beautiful and best preserved in Sri Lanka. An exhilarating climb to the summit offers a remarkable insight into ancient town planning, engineering know-how and architectural skills of those who established the well-planned city. 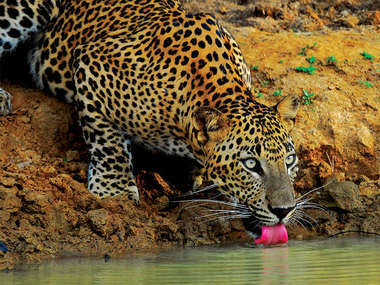 One of the best places to observe and photograph the elusive leopard, Yala National Park, Sri Lanka’s second largest wildlife reserve, has the highest concentration of leopards anywhere in the world. 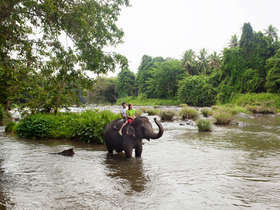 The park’s open terrain with scrubs, lagoons and grasslands also supports herds of wild elephants, sloth bears, mugger crocodiles, spotted deer, sambar, toque macaque monkeys and a variety of birds. It is believed that, presently, Yala is one of the most visited wildlife reserves in all of Sri Lanka.